"Caught Graham at The Knitting Factory in Hollywood on Jan.4th and it was depressing. Maybe 25 people showed up! In fairness to Graham there was little or no promotion for this, and there was a torrential downpour of rain this night which probably kept some fans away, but this was sad. The show opened with "Eyes Of The World" and straight into "Love's No Friend" before the band went into some Taz Taylor numbers. A couplle song titles I remember were "Happy Hour" and "Welcome To America" which sounded pretty good. I was surprised to hear "Stargazer", I know he's been playing this in Europe but thought he might pass on it here in the States. Nice version of this with Taz Taylor playing this one well, ,in fact he was on all night. Last three Rainbow tracks were "All Night Long","Since You Been Gone" and "Lost In Hollywood"(kinda funny as there were no people here!). "Desert Song" represented the MSG era but we didn't get any Alcatrazz numbers. Too bad as I really like the album they did with Steve Vai - "Disturbing The Peace". I gotta say Graham handled the situation well, showing good humor regarding the sparse crowd with this gem: "...bloody hell, where are all the people? There's more of us on stage than you out there!...." GB's voice was not in the best shape as he was suffering through a cold, but he still sounded good, though I was shocked to see how old and frail looking he was. Oh well, I'll still go see him if he ever does another show out here. Would be nice if he and JLT could bring their double bill to America. C'mon guys,make it happen!." "Wow what a difference a couple weeks can make! Graham was on fire! From the first verse of "Too Young To Die, Too Drunk To Live" you could see and hear that Graham was over his cold from the gig with Taz Taylor . I was blown away by the man's power and aggression in his voice, simply stunning. This was a benefit gig for Fender guitars Kids Rock Free charity and only cost $10 to get in. There was an auction going on as well with guitars and other gear / memorabilia up for grabs .Being as there were about 5 other acts playing, this allowed Alcatrazz only a 45 minute set, and they made the most of it. Opening with the aforementioned 'Too Young To Die, Too Drunk To Live', the band went straight into "God Blessed Video" which tore the place up and got a great reaction from the crowd. Speaking of the crowd, this was a much better showing than the disappointment from two weeks ago, with about 150 people here for this. "I'm haunted. Great voice and performance by Mr.Bonnet, resplendent with cool hairstyle and sunglasses, backed by the rousing sound of the Taz Taylor Band. What an amazing tour, thank you very much indeed!" European Setlist: Eyes of the World - Weiss Heim / Love´s no Friend / Fighter`s Fist / Radio Luxembourg / Pot of Gold / Chilling Times / Blues - Stargazer / Desert Song - Rock Bottom / Happy Hour / Wall of Sound / Ufozza Medley - Caffeine Racer / Night Games / All Night long / Since you been gone / Welcome to America / Lost in Hollywood / The Reprise / George`s Song / Parisienne Walkways. review, set-list & photos: Ralph Grille. 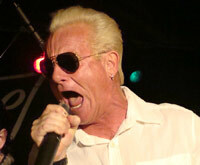 You can still catch Graham Bonnet & The Taz Taylor Band for more European shows in the next few weeks. Highly recomended! April 15th: Hammerhalle City Dome, Rosenheim, Germany • April 16th: Planet, Vienna, Austria • April 17th: Avalon, Budapest, Hungary • April 18th: Retro Music, Prague, Czech Republic • May 2nd: Apelsin, Moscow, Russia. "Well, I iwas lucky enough to visit a friend studying in Vienna, and catch Graham's show. Bonnet has never played in Greece so I have never seen him before and I was really excited about it. I arrived in town on the day of the show, and managed to get to the club ten minutes before the support ( a stupid poser band called The Roxx ) went off stage. Bonnet was in good mood and his voice in very good condition, although I can't compare it with other appearances since it was my first time. I was also impressed by his stage performance, as the crowd attendance was very low. I think less than 100 people, which left me with a negative feeling. Anyway, Bonnet began on with Eyes of the World and then Love's No Friend. Some Taz Taylor songs were played, which i found interesting. Taz Taylor is an excellent guitarist and the band is solid. Stargazer was a pleasant surprise. Other highlights included All Night Long, Since You Been Gone, my personal favourite Lost In Hollywood and MSG's Desert Song. The set was very short, aproximately 1h 15m, so I believe some more songs, from Alcatrazz for example, could and should have been fitted in. All and all, I had a very good first evening in Vienna." The first show of Graham Bonnet's Brazilian tour was in Santos on July 2nd. According to our correspondent Roberto Souza, Graham had been receiving treatment for a throat infection but still managed to put absolutely everything into his performance (see the photo opposite!) After only one hour's rehearsal time with his Brazilian backing band Graham said that the Santos show would be a "rehearsal concert", but it seems that everyone concerned did a great job, and an estimated crowd of 500 thoroughly enjoyed the show. There are two further shows in July (see the news item below for details). Bad Girl (Rainbow) / Stargazer(Rainbow) / Will You be Home Tonight (Alcatrazz)/ Love´s no Friend ( Rainbow) / Since You´ve Been Gone (Rainbow) / All Night Long (Rainbow) / Lost in Hollywood (Rainbow). Encore: Night Games( solo). 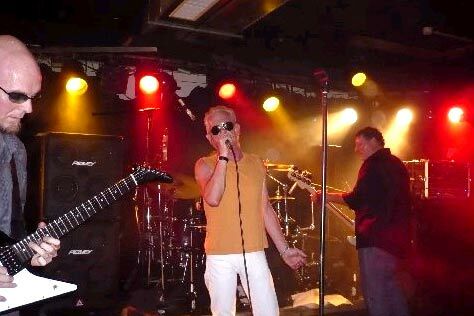 "Yesterday I saw the last show of Graham Bonnet 's Brazilian tourl. It was another excellent show, with Bonnet in very good shape, and in great form. The set list: Eyes of The World (Rainbow) / God Blessed Video (Alcatrazz) / Desert Song (MSG) / Bad Girl (Rainbow) / Stargazer(Rainbow) / Will You be Home Tonight (Alcatrazz) / Kree Nakoorie(Alcatrazz) / Sons and Lovers (Alcatrazz) // Love´s no Friend ( Rainbow) / Since You´ve Been Gone (Rainbow) / All Night Long (Rainbow) / Lost in Hollywood (Rainbow) / Night Games( solo). After the show Graham showed great kindness to the many fans present : posing for photos and signing CDs and LPs. 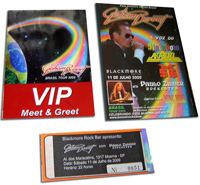 Attached is a picture with a ticket, flyer and backstage pass for the show. Albertino also reports that Joe Lynn Turner has now also been lined up to play the (wonderfully named) Blackmore Rock Bar in Sao Paulo, on t 1th August . "There´s a great video interview with Graham, and two live acoustic songs on the TV Estadão website, an amazing, lung-bursting 'Love´s No Friend', and 'Night of the Shooting Star' from the third Alcatrazz album (Dangerous Games) - Graham dedicates it to Michael Jackson. and then click the thumbnails on the right side of the page."